As I write this, I’m in the midst of editing photos, arranging fabrics, and filling tiny vials for the embroidery kits that will be in the shop next week. Did you say filling tiny vials? Yes that is correct. I’ve finally gone off the deep end, and the Embroidered Talisman Kits I’m introducing next week come with tiny vials of gem beads and dried herbs, like little spells. To be fair, I was practically born “off the deep end” and have a deep faith in the healing powers of the natural world, and a belief that everything around us carries energy. So back to these spell jars. I’ve selected the included gems and herbs based off of my own experience with them. Most of the herbs I have grown myself (or, they grew on land that I’m caring for and I just nurtured them) and the gemstones are actually chip beads, which are a byproduct of gemstone production, and since they are beads can be sewn to your embroideries if you’d like. Here’s the backstory to why I chose to include these natural elements with each kit. 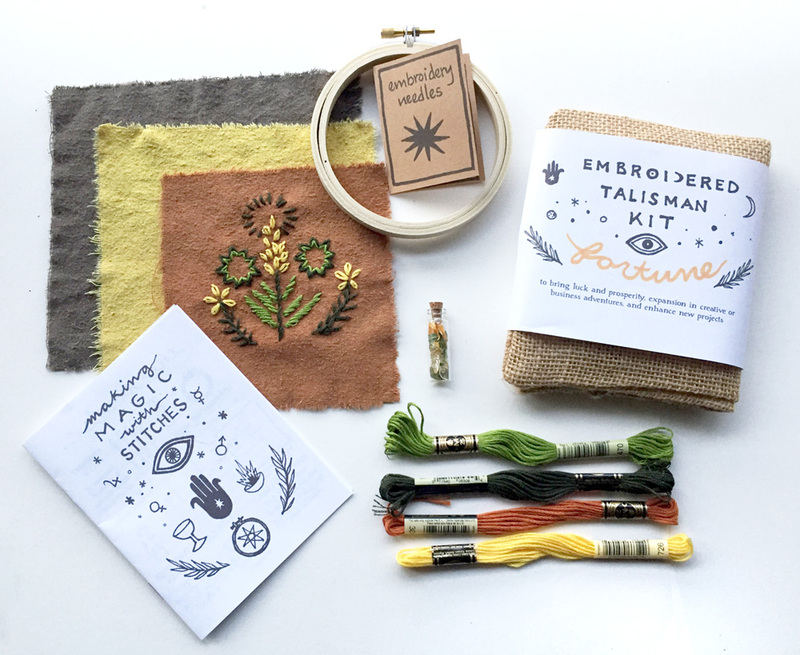 FORTUNE Talisman Embroidery Kit: to bring luck and prosperity, expansion in creative or business adventures, and enhance new projects. Goldenrod - I have a deep relationship with this weedy bloomer. It’s often accused of causing late summer allergies, but it’s actually Ragweed that causes allergies (goldenrod just has such showy blooms that people couldn’t handle her ostentatious beauty and had to make up nasty rumors about her). Interestingly, goldenrod is actually considered to support healing of allergies. It’s Latin name is Solidago, a fitting name for an herb also known to heal wounds (aka “make solid”). In an energetic sense, this herb is the epitome of abundance. In my area of Upstate NY, it’s considered a weed, and over time will take over entire fields. It reproduces through both seed and underground runner roots - basically, this is a plant that knows a thing or two about expansion. You can read more about my personal experience with goldenrod here. Jade or Malachite (depending on availability) -Jade is a symbol of tranquility and release of negativity. It’s virtues have been highlighted in China since ancient times. Malachite is considered grounding, and may help handle the transformations within growth. Citrine - known as the “merchant’s stone” citrine can help energize and attract generosity (both from you and to you!) It is also said to raise the mood and increase self-esteem / confidence. Garden Sage - While White Sage gets much attention, Salvia Officinalis, or garden sage (the kind you would cook with) carries similar cleansing energies and does not have all the conflict that white sage is currently facing (if you haven’t heard - in short, the rapid popularity of white sage is said to be causing over-harvesting, combined with the over-development of the land it is native to, and the appropriation of sacred practices from native cultures who in some states are not even legally allowed to practice their religious ceremonies has caused many in spiritual circles to choose other options). This sage grows happily in my garden, and stroking my hands through it leaves me with a soothing and calming scent that carries me away on a fluffy cloud… which is not surprising because it can also be calming and soothing the digestive system as well. Lavender - I mean, do I even have to say anything? The scent is the basis of many an eye pillow, relaxing bath salts, and soothing balms. I also cannot help myself but to run my fingers through it’s rambling branches every time I walk by for a quick fix, inhaling it’s peaceful energy. Fluorite - considered to be purifying and aiding in the accessing of intuition, while helping to integrate new information or ways of being. Sodalite or Lapis Lazuli (depending on availability) - Sodalite is a stone for mental clarity, accessing an inner truth. Lapis also stimulates clarity and brings awareness to the higher mind. Both are associated with the third eye. Lemon Balm - A member of the mint family who officially goes by the name of Melissa, which calms the nerves and also has antiviral qualities. Energetically, its sweet smell and thriving nature have made many a folk magician turn to it for love spells. It also makes an enchanting mint iced tea on a summers day, I highly recommend including this in your garden ( be careful it doesn’t take over!) though I’ve never had any luck with it as an indoor plant. Yarrow - Said to be the herb that sprang from Achilles heal, this flower is incredibly healing in both love and war. Seriously though, every wound I’ve gotten within reach of some yarrow has healed impressively. I once nearly chopped off the tip of my middle finger with a kitchen knife and wrapped some fresh yarrow up in the bandage, and there’s barely even a scar to show for it. It is also said to draw love your way, and traditionally used in love sachets. Carnelian - A grounding stone that can help clear your perception, it also supports stimulating and invigorating energies. It’s vibrant red / orange is a shade of passion and action. Garnet - Said to be revitalizing, garnet may work to sharpen your awareness and tap into personal power. I love the combination of these last two stones for drawing love. Rose quartz is often cited as the stone for love, but I feel that garnet and carnelian bring with them the energies of active discernment that is often missing when we think of love. It can be so easy to get lost in the idea that this or that is love, and clarity can be of great importance in the haze of romance!! HOW TO USE: These vials can be placed on an altar as an offering, or the gemstone beads can be incorporated into your embroidery by sewing them to your work. The herbs included could also be used as incense by placing on a burning coal (of course, using fire safety! Only burn on fire safe surfaces! In well ventilated areas! Never leave burning herbs unattended!!) or tucked into the back of your stitches before framing your work. You can also just place the vial somewhere you’ll be reminded of your intention for it. Really, whatever you feel called to. So that’s what these vials are all about! Where do I get this information you may ask? I’ve been researching herbs in study and also in the field for many years now, below are some of my favorite sources. As for the stones, while many people might dismiss that a crystal can really “do” anything, I’ve consistently found myself drawn to stones whose supposed actions are exactly what I need, as in - pick up a stone, be captivated by it, look it up and it relates directly to the issue I’m currently facing or questioning. So believe what you want, but consider that the energy patterns that create the color and geometric forms of these stones just might be capable of influencing your own personal energy patterns. At the very least the vibrations of their colors can help influence your own mood and energy, because color is our brains interpretation of different light frequencies, quite literally seeing different colors is our brain reading different vibrations (more on that in a later blog post). Gemstone Information - The Crystal Bible, Energy Muse blog. What Happened to the Clothes you were making?